The long white bridge is one of the most photographed bridges in Charleston, SC. This plantation with over 464 acres of historic gardens, on the Ashley River, dates back to 1676, originally a rice plantation. Magnolia Plantation offers so much for wedding couples, from The Carriage House and Lawn, built in 1840, to The Conservatory and Schoolhouse Pond Lawn, to the Plantation Veranda overlooking the White Bridge Lawn, The Red Bridge, The Pavilion, and many backdrops of spanish moss trees and well manicured gardens. This images is breathless, while very basic, in post editing I did a lot to this image, and gave it a more rustic theme which I love, while concentrating on my exposure to be exact, and putting the right amount of depth of field, giving the water a deep reflection of it all. 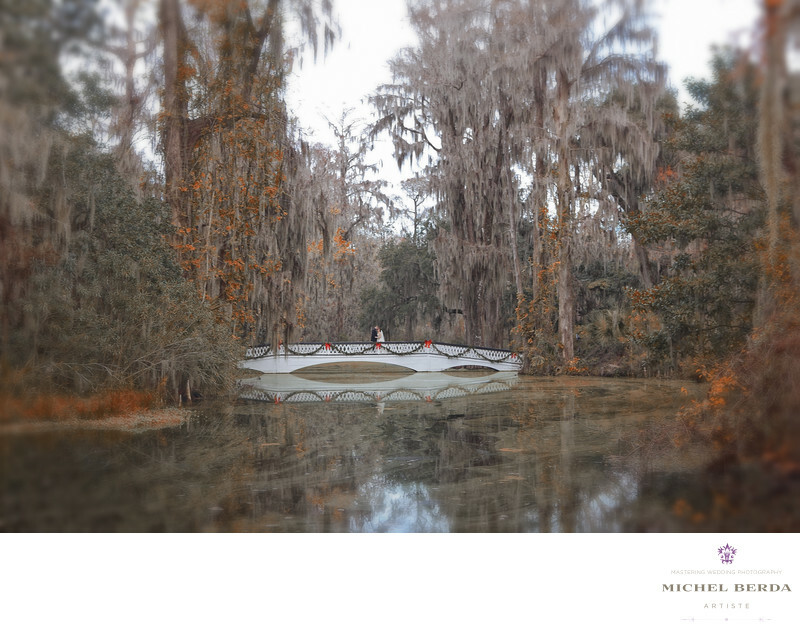 Keywords: bride (66), groom (69), magnolia plantation (9), magnolia plantation and gardens (3), photographer wedding (3), wedding photographers magnolia plantation and gardens (3).